The 20” will do fine as our kids are moved out and fits perfect for the two of us. If I was feeding the whole block we live on than yes the 24” would be it, for sure. Joe did offer to pick my Wichita up for some mods but I declined and moving on to Horizon. Thanks for all the replies folks. Out of interest was it the lack of phone call that made up your mind or overall frustration with the product? 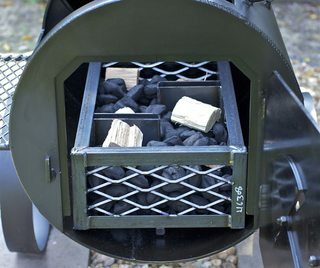 I’ll leave a positive comment about the Wichita...the charcoal basket works very well with no smoldering using wood chunks spread through it and will let you walk away for much longer periods. It should be included with the current design at no extra cost, that is, if you want an offset coal burner. 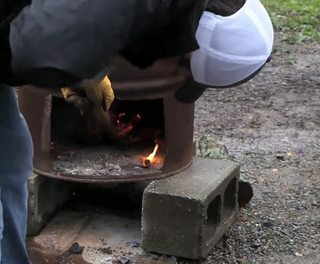 BurningStick wrote: I’ll leave a positive comment about the Wichita...the charcoal basket works very well with no smoldering using wood chunks spread through it and will let you walk away for much longer periods. It should be included with the current design at no extra cost, that is, if you want an offset coal burner. Coals are the solution. Either use the basket or a burn barrel and you're good to go. Joe emailed me and said that they are lowering the intake damper and making it bigger...and he’s watched all the forum discussions and from the way it sounds he is basically implementing you’re mods as they have already built a door ( like your’s ) tested it and will be the only change to the Wichita that he mentioned. If you are thinking...I’m getting one, your wrong as I’m going with Horizon after talking with Roger. I really wish that I had done more research before ever buying this offset. I see lots of activity happening now regarding the Yoder offsets, but somehow the fact that everyone from the beginning suggested the firebox is mounted too high got lost in translation. The "fix" seems to be a door mod. The only reason I implemented a door mod was because I didn't want to go to the extreme of cutting the firebox off and relocating it myself. I never imagined the door mod to be the ultimate solution here - it's just a "workaround." I guess they're holding on to the idea that somehow their design is so unique that it needs to be preserved, instead of imitating the Horizon design that everybody seems to rave about. I fail to see how it would be difficult to lower the firebox during manufacture so at least the new units would benefit from it. Retrofitting existing units shouldn't be the deciding factor on the design choices. If you buy a 2016 car model and the new 2017 model gets improvements, the car manufacturer doesn't rework your old car or give you a new one. You bought the 2016 model, so you have to live with it. The same goes for things like iPhones. If you want the latest one, you have to buy one, and they aren't cheap. Apparently there will be new videos soon demonstrating Yoder offset fire management techniques. The training continues. In the article, the author says, "Coincidentally, Franklin was rolling the first of his backyard smokers out of his Bastrop welding shop. 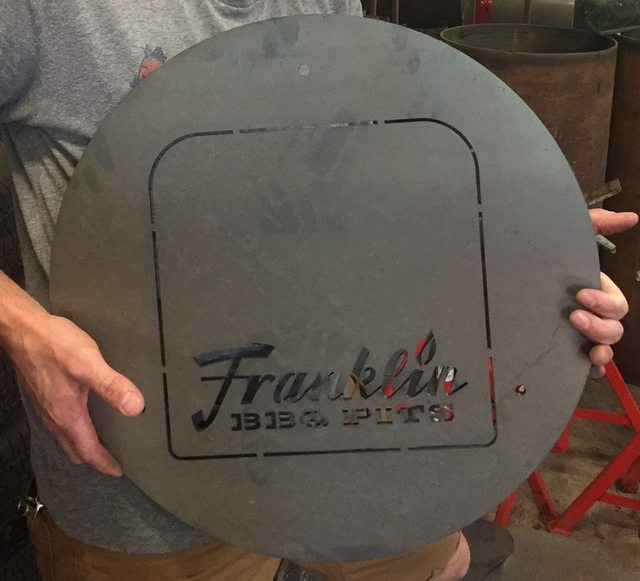 Proving himself to be quite the Texas barbecue mensch, Franklin agreed to keep one pristine so it could be used for kosher cooking." Looking at the photos, I see his trademark smokestack plenum at mid-grate level, and a fire door with no movable intake vent. The fire door appears to have "Franklin" cut out of it, which would allow some air to flow even if the door is closed. The smokestack looks larger than the Wichita's 4" diameter smokestack, so it is probably in the 6" diameter range, and possibly longer (not visible in the photos). The smoker didn't even have a mounting hole for a gauge when they used it, so Franklin drilled an impromptu hole for a digital probe. Franklin likes his gauges mounted near grate level, so I imagine he'll mount one low on the center of the door. I'm not a fan of the base shown on this unit. Most cookers are stable with 4 legs on the cooker body - I'm not sure why he wanted to add 2 more legs under the fire box. I think it would look more like Texas if it had some wagon wheels instead of those industrial-looking metal wheels, but that's just me. He's propping a restaurant pan under the grease drain, which make me wonder if there is even a bucket hook on that prototype yet, but we can see where the drain is located. Another thing I noticed was the rounded end of the cooking chamber makes it look like his big propane tank smokers, but the other end on the fire box side is flat. I guess this was done to simplify assembly of the 2 pieces, or possibly to minimize the overall length of the cooker. I've been wondering what these new backyard smokers were going to look like, and these photos are the first ones I've seen. I'm looking forward to hands-on reviews when people start cooking with them. Aaron getting the fire started. Notice the small shovel below the firebox - Aaron's preferred tool for working a fire. The firebox appears to be mounted a couple of inches below the center line of the cooking chamber. There's a good fire going in there, and I don't see any smoke blowing backwards out of the open door. 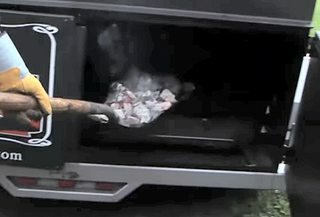 This smoker must have some good draw from that big smoke stack. 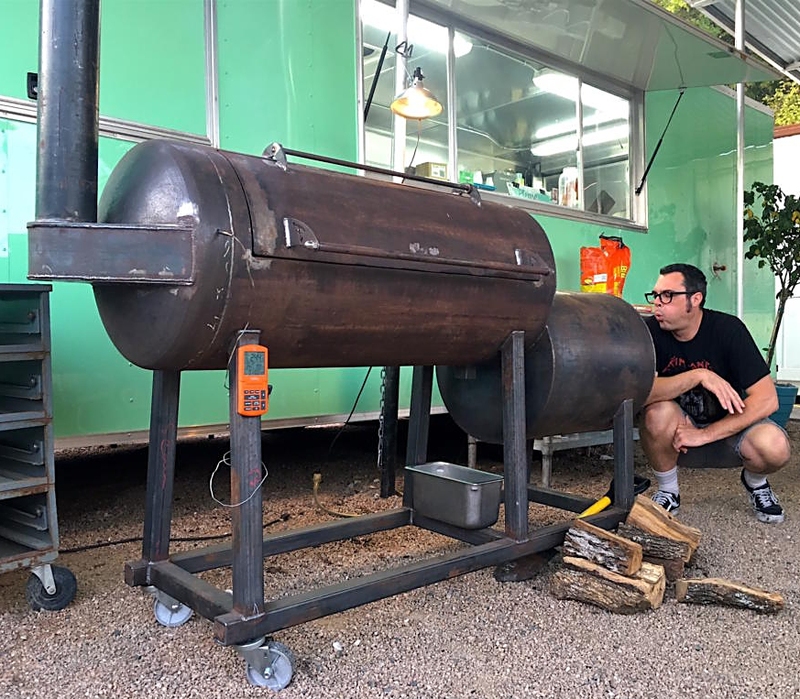 This firebox doesn't look insulated, but Aaron started using insulated fireboxes on all his latest restaurant builds, so I'm hoping he'll offer that as an upgrade option. Last edited by slamkeys on Thu Oct 12, 2017 12:20 am, edited 2 times in total. Interesting . Thanks for sharing. In his videos using the Old Country he cooks with the door open. Maybe that’s why there are no adjustable vents on his cookers? I went back and looked at the diagram from Aaron's book and what do you know - a six-legged skid and a monster smoke stack! I think he has been planning this for quite a while. 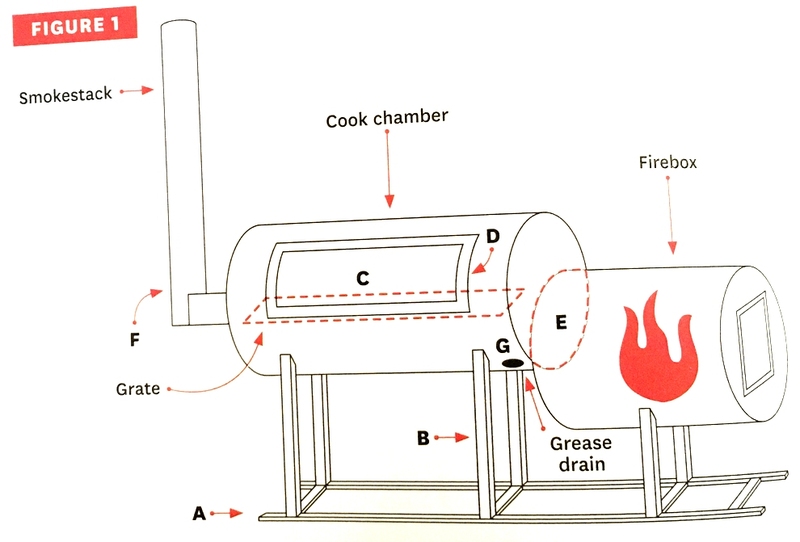 The proportions in the diagram don't appear to be accurate, based on the massive size of that firebox, but the design is the same, even the location of the grease drain. Maybe the firebox on that prototype is deceptively long in a way that is not perceptible in the photo, because that would be one reason he felt it necessary to add the extra 2 legs. The huge firebox in the book diagram makes it look like it needs extra support. The reason I bring up the new Franklin smokers is they might be a direct competitor to the Loaded Wichita. The one in the photos appears to be a 20" model. Has anyone heard what sizes Aaron will be offering for his backyard smokers? I"ve been contemplating a swap with one of these but it's too early to tell whether I'll do it or not. 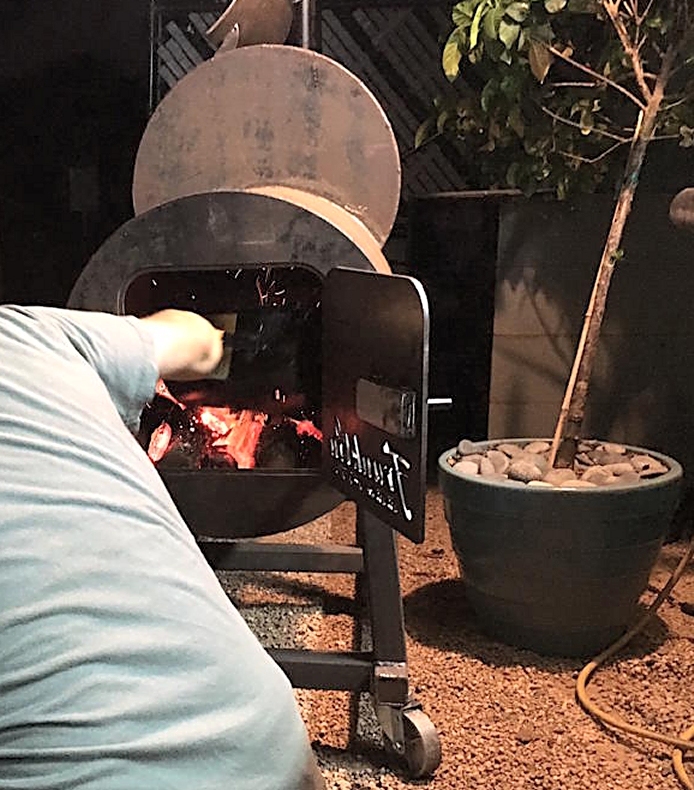 With the grease drain being located on the right side of this smoker, it would indicate that the angle of the cook chamber actually rises a bit as it goes towards the left-side-mounted exhaust. This would certainly encourage a good flow across the cooker, as opposed to placing a plate with six inches of steel forcing all the smoke and heat downward as it resists flowing across the cooker. Our Horizon has the drain located opposite the fire box but it still drafts so well that you could pretty much place a match in the FB and watch the flame tug towards the exhaust. Since the Franklin unit is mounted on a platform, I see nothing wrong with adding the extra fire box support legs. Couldn't hurt. 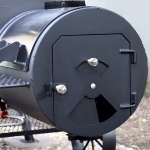 RogerWilco wrote: With the grease drain being located on the right side of this smoker, it would indicate that the angle of the cook chamber actually rises a bit as it goes towards the left-side-mounted exhaust. This would certainly encourage a good flow across the cooker, as opposed to placing a plate with six inches of steel forcing all the smoke and heat downward as it resists flowing across the cooker. Bingo -that sounds right. 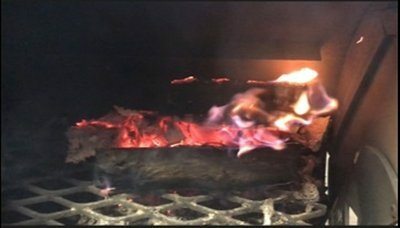 I thought the drain location was an odd choice because it might increase the risk of a grease fire when the flames lick over the firebox on that end, but he's been using that same design at the restaurant for years without a fi... wait, his smoker room just burnt down. The jury is still out on that one. Maybe he puts it there because heating up that grease to the extreme adds flavor to the meat - who knows. The cooker does appear to dip in the middle, like the firebox might also be angled down towards the center. I don't think Aaron uses fire grates either. 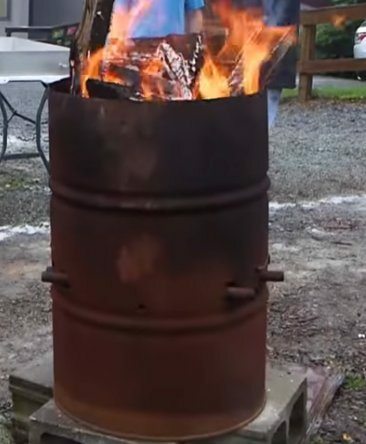 He puts the wood directly on the firebox floor up against the rear wall and stacks it so the air can flow between the logs. Yoder_Herb finally explained what we've been doing wrong all this time. You have to build the fire on the back right side up against the fire door. Sheesh, if only I'd known. freddie987 wrote: When do you think us mere mortals will hear some results from whatever testing Yoder is getting you to do? I don't think the testing has gone very well. After a handful of reports that Yoder is updating their design, not a single photo has been posted, and the new Cheyenne owner who complained on the Yoder forum about his smoldering issues was basically told to build his fires in the right rear corner of the firebox as the solution. He is not happy right now.